In a strange dream, Don finds himself out in the wilderness of Massachusetts. He is approached by an Indian Chief who asks him what he hears; the rivers and the wind of nature or the brick and steel of the city? As Don contemplates the question, he spots the Chief’s granddaughter, Radical, battling Complete Carnage. Don leaps in to help Radical and suddenly awakens. He finds that his brothers all had the exact same dream, though unlike Don, they only observed the battle and did not participate. Elsewhere, Radical and Complete Carnage awaken by a lonely stretch of highway, both weakened by their battle in the Dreamscape. Carnage flees to the safety of the highway asphalt while Radical is unable to stop him. Back at the farm in Northampton, the Turtles approach Splinter about their dream. He tells them that a shared dream is a strange thing and that he has also been seeing visions… visions of a giant neon buffalo. Following Casey’s directions, the Turtles travel out into the wilderness until they stumble upon the forgotten tourist trap of Buffalo Rock, where a decrepit neon sign shaped like a buffalo sits. Below it, by the highway, they find Radical meditating. Overjoyed to find that she hadn’t died when she used her “particle beam” to defeat Carnage in their last encounter, they’ve none-the-less found that she has changed. She no longer considers herself a superhero and has gotten a job in the Indian Studies department at the Museum of Natural History in New York. This has helped her get in touch with her American Indian roots and finally grow up. 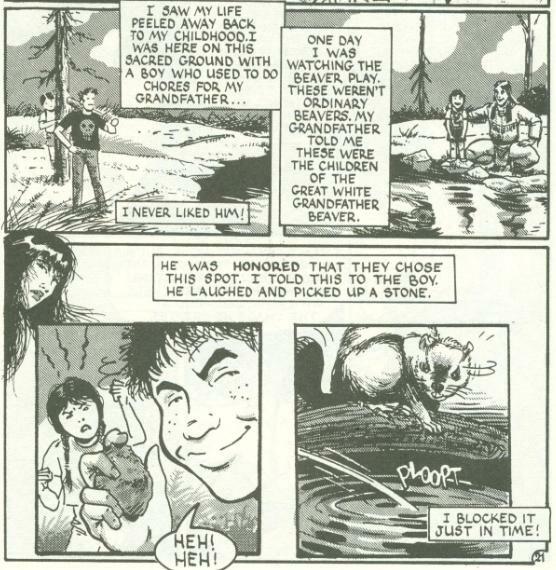 The Turtles tell her of their dream and the spirit of her grandfather that led them to her. Down the highway a bit, Carnage emerges from the asphalt, exhausted. He journeys into a small town where the manmade structures can revitalize his powers, though he fears sleep, as he doesn’t want to be trapped in the Dreamscape again. Frustrated, he destroys a small store, swearing death to Radical. Back at the highway, night falls and Radical starts a fire, preparing a ritual to summon guidance from Wakinyan Tanka, the Thunderbird. 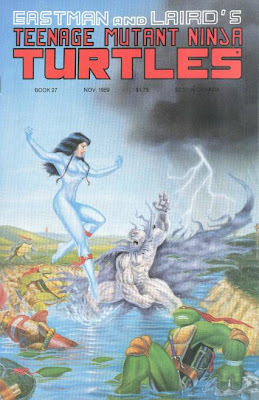 The fiery feathered specter appears to her and the Turtles, reminding them to keep in mind their enemy’s strengths as well as their own. Down in the sewers, the tired Carnage grumbles to himself how much he hates Radical and finally collapses from exhaustion, falling asleep. And at the bonfire, the Turtles ask Radical to tell them the whole story; how she survived apparent death and where her mystical powers came from. Radical spills the beans, explaining that in her ignorance, she believed her powers to be alien or radioactive or something corny like that. In reality, her grandfather was a great shaman and she has long been connected to the spirit world. She didn’t realize this until her “particle beam” transported both herself and Carnage to the Dreamscape. From there, she recalled a repressed memory from her childhood. Her grandfather had taken her to a lake where he said the children of the great white grandfather beaver dwell. She found a local white boy trying to throw rocks at one of the beavers and stopped him. Radical then saw a vision of the grandfather beaver and knew that both she and the boy had been chosen; she to represent the forces of nature while he was cursed to represent the destructive forces of man. Don asks why he was able to fight in the Dreamscape while his brothers were not. Radical explains that because he had read books on Native American history, her grandfather’s spirit chose him to come to his granddaughter’s aid. Sensing that Carnage has entered the Dreamscape, Radical creates a portal to the realm through the neon buffalo sign, leaving to spring her trap. Inside the Dreamscape, she calls the Coyote Spirit to guide her to Complete Carnage. Taunting the villain, she lures him back to the neon sign. Carnage sees it as a manmade object to give him power and tries to merge with it. This ends up transporting him back to the waking world, where the Turtles stand ready to fight. As the Turtles keep him occupied (and try to prevent him from reaching the highway asphalt), Radical prepares a spell in the dirt. Alas, the Turtles are no match for the villain, who clobbers them and begins thrashing Radical. Radical tells Don to remember what he knows about Indian folklore and finish the spell himself. Don tries, but can’t recall it all. Just as Carnage leaps toward the asphalt, Don remembers that the Coyote Spirit is the trickster of American Indian mythology and hastily draws the canine. He does so just in time, as the asphalt transubstantiates into water right as Carnage begins to merge with it. Merging with a natural substance, his only weakness, Carnage’s atoms scatter as the highway turns into a raging river and his essence is swept away for good. Later, as the Turtles prepare to leave, the voice of Radical’s grandfather once again asks Don what he hears. Bidding Radical goodbye, Don replies that he hears the spirit of the wind. *Chronologically, this story follows TMNT (Vol. 1) #28. Chronologically, the next story in sequence should be TMNT (Vol. 1) #46. *The Turtles last met Complete Carnage and Radical in Tales of the TMNT (Vol. 1) #5. *The Turtles will encounter Radical again along with a clone of Complete Carnage in TMNT/The Savage Dragon #1. The real Complete Carnage will not be seen again until Tales of the TMNT (Vol. 2) #41. *Leo briefly references the events of TMNT (Vol. 1) #14 (though the editor’s note mistakenly cites the issue as #17). *This is only one of two issues published between TMNT (Vol. 1) #21 and TMNT (Vol. 1) #45 that is considered “canon” by Peter Laird (though several issues published in that time-span do not conflict with any narratives and can be considered "canon" due to this). *I place this story after TMNT (Vol. 1) #28 because that issue functioned as an epilogue of sorts to Veitch's "The River" trilogy and fits best as taking place directly after that story. Thanks to Michael Dooney, Complete Carnage and Radical have finally become decent characters. Dooney’s editorial at the beginning of this issue is interesting. 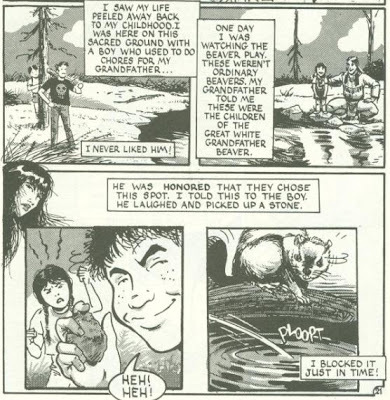 First, he apologizes for inadvertently putting Volume 1 on a “Native American kick”, as he wasn’t aware that Rick Veitch was using American Indian mythology in his “River” trilogy and the similarities between their installments are purely coincidental. More importantly, though, he falls just short of admitting that Complete Carnage and Radical were terribly shallow characters in desperate need of revitalizing and revamping. And he was right! Complete Carnage and Radical had very little personality or convincing motivations in their previous appearances and their original origin always felt half-baked and uninteresting. Dooney works around the established origin, not so much contradicting it as he does substantiate it with actual content. The “TMNT & Other Strangeness” RPG guides had previously made an attempt at giving the characters a less shallow origin, though they went in a totally different direction (spirits of warring alien factions traversing the universe and possessing two hapless New Yorkers). All things considered, I prefer Dooney’s more mystical take. I rather like his characterization of Radical, here. When she first appears, she acts much more mature and intelligent than the dull-witted, bland super-heroine stereotype of her previous appearances. She starts to get preachy about the glory of American Indian history and the evils of Whitey, but that's pretty much a prerequisite for any media that involves American Indian characters in any capacity. However, once she enters the Dreamscape and approaches Carnage, she immediately reverts back to her old self, recklessly taunting the villain and making snappy insults. She feels far more well-balanced, now. Complete Carnage, on the other hand, doesn’t get a whole lot better. He still has a cool name, cool powers and a cool look, but jeez are his motivations shallow. He’s an idiotic fool that wants to kill Radical just because and he’s far too stupid to use his vast powers competently. He’s always struck me as a waste of potential; a villain that has everything going for him but his personality. At the same time, when he does show up later as a grim-dark serial killer, it felt terribly insincere. I imagine there’s got to be a balance somewhere. At any rate, I actually found his clone to be a far more enjoyable take on the character, even if he was just a mindless, slobbering beast. Dooney’s art is Dooney’s art and that’s awesome. I’ve reviewed several of his stories by now and I’m running out of ways to say the same compliments over and over again. Anyway, Complete Carnage and Radical have finally passed that hurtle that’s turned them into interesting recurring characters. 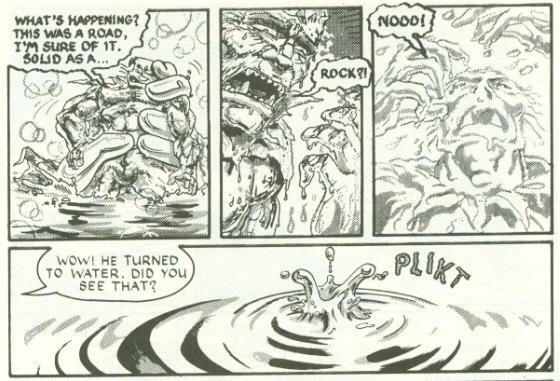 They won’t get many more appearances from this point forward, but “Dreams of Stone” definitely stands as a good story showcasing how you can take two bad characters and make them work with just a little effort. Kinds makes you wonder why Donatello and Radical never hooked up in Tales 2.41... Then again, maybe the less we say about that subject, the better! Also, I'm glad you made references to the ads for the movie. They are one of the reasons I prefer original Mirage issues to their reprints; the sense of nostalgia is just overwhelming! 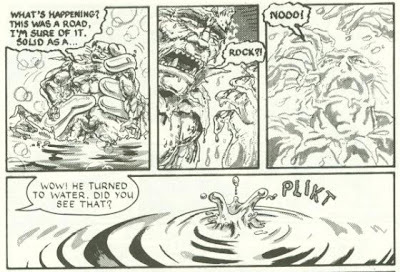 I might actually argue for a chronological placement of #27 before #23, as the Turtles here seem much more dismissive of Native American beliefs than they would be after the events of "The River".